Machine gun is used to fire bullets in speed as the trigger is pressed. It is used to fight with enemies. Machine guns are using under the license of government. It is the most important machine for all military and army forces as well as police, rangers and many more. There are so many types of machine guns like light machine guns, heavy machine guns, Assault rifles, automatic shotguns and submachine guns. Here in this post I am sharing with you 10 amazing machine guns in the world below. These all machine guns are top listed and highly ranked due to their functions and powers. Machine guns are fully automatic weapon which is used when attached to the mount from the ground on bipod and tripod. 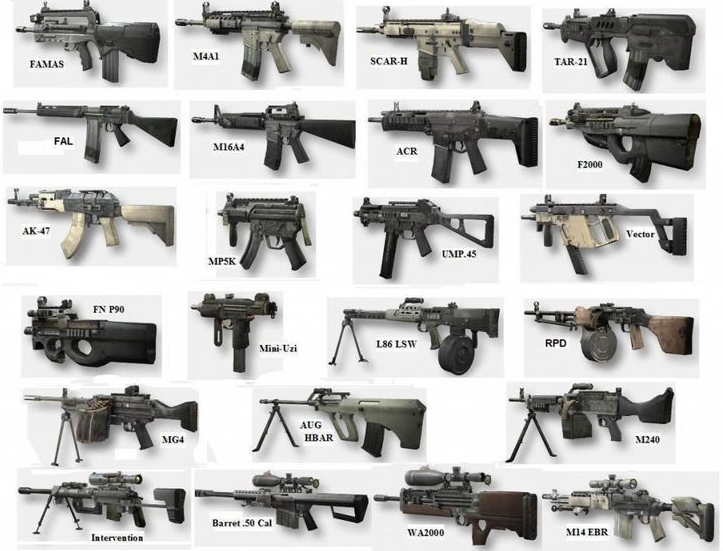 In this post you will find the details of world’s most powerful and dangerous machine guns. These all are top listed. Let’s check out them below. Kalashnikov AK is also known to be as the AK-47. It is an automatic gas operated assault rifle developed by Mikhail Kalashnikov. This machine gun is still popular in the world because of its substantial reliability and low production costs compared to any western weapons. It is available in various countries and usually seen for service with armed forces and irregular forces also in the world. MG4 is also known as MG43 was made by Heckler & Koch Company. This machine gun is light in eight but has been selected to replace old 7.62mm MG3 machine gun. It has reliable functions with adverse conditions without any need of adjustment of gas system. It is a air-cooled and belt-fed gas operated weapon for everyone. HK416 is an assault rifle was made by German company Heckler & Koch. It is a short-stroke gas system machine gun. It is one of the popular gun is using by U.S. army. It is designed with adjustable gas block that allows reliable operation on short-barelled models. This machine gun was used by U.S. army in war in Afghanistan, Iraq and Northern Mali. This Thompson M192 machine gun is a lightweight ground mount. It is a tripod fielded machine gun was made by Capco. It was made in such a way that it shoots six hundred rounds in a just one minute. This machine gun was developed for U.S army force but also using for security reasons. It is the best and popular machine gun in the world. FN F-2000 is a bullpup assault rifle was made its debut in March 2001 in United Arab Emirates. It is a modular weapon which is a selective five machine gun operating from a closed bolt. It is a gas operated automatic machine gun which is using for both safety reason and trigger mechanism. It is a deadly weapon having NATO caliber of 5.56×45, which is tremendous and powerful. The MG# is a popular and well demanding German machine gun which is using for general purposes. This weapon has gas chamber with automatic air-cooled belt-fed operated firearm. It was utilized in World War II because of its smart and unbelievable performance. Its speed is fast which makes this machine gun popular. This is a popular XM307 Advanced Screw Served Weapon was developed for the U.S. army Tank-Automative and Armaments Command. This is a light weighted and belt-fed grenade machine gun with shell capability. It is a two-man portable machine gun or vehicle mounted that can kill enemy out to 2,000m. It is powerful and dangerous machine gun in the world. Uzi Sub is an Israeli open-bolt operated submachine gun. It is also known as a machine pistol was designed by Major Uziel Gal. It is a personal defense weapon for officers, tankers and artillery troops. Mostly, it was used to the Israeli Army and measured as a small but very useful for expert shooters. Thompson M1921 is an American submachine gun was made by John T. Thompson. This submachine gun is mostly favoring by soldiers, civilians, criminals and police. It is popular because of its high volume of automatic fire, 45 ACP cartridge and accuracy. It is ranked on number 2nd in the list of top 10 powerful machine guns because of its astonishing shooting rounds. DSR 50 is a sniper rifle machine gun which was made and developed by German company DSR-Precision. This is a bolt-action anti-material rifle which produces powerful 50 caliber rounds. It includes a hydraulic recoil buffer and innovative muzzle attached. This machine gun is utilized by soldiers, officials, cops, and agencies. It is the number one machine gun in the world. These 10 amazing machine guns in the world are very powerful and dangerous. They are using by soldiers, armed officers and agencies as well as criminals and personal safety purpose because of their powerful and amazing shoots round.